Similarly to the Hubble Space Telescope, observations of the stars and Earth are also conducted from the International Space Station (ISS). 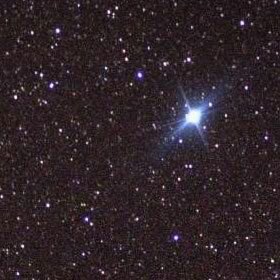 This is Canopus, the second brightest star in the night's sky. Canopus is a first-magnitude star in the constellation of Carina. Canopus is 65 times larger and 15,000 times brighter than our Sun. According to NASA, it would take as long as 300 years from Canopus to reach the Earth traveling at the speed of light. This means that the light we see today was emitted from this star 300 years ago. In this image, you can see the boundary between day and night. The boundary line is blurred because of the air. 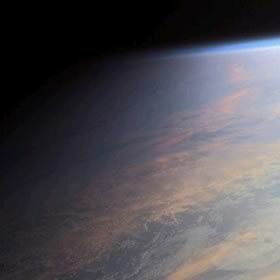 If you look carefully at the upper right portion of the image, you can see Earth's thin layer of air. Do you notice that the color is different depending on the altitude? This difference of color is caused by a phenomenon called the "scattering" of light. This is also the reason why the sky turns orange during a sunset. This is a very unusual image. 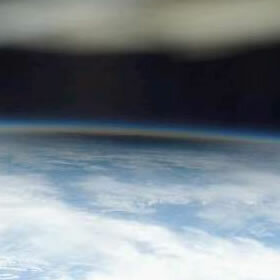 The dark spot that's cast upon the Earth is actually the shadow of the moon. A phenomenon called a solar eclipse, where the sun, moon and the Earth lines up in a straight line, was under way when this picture was taken. The blurred section in the upper portion of the image is part of the observation window. 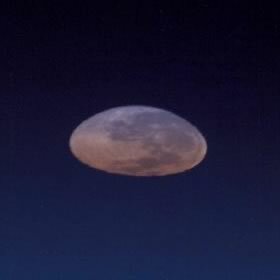 The moon, as seen from the ISS, changes its shape from a pale-white circular form to a pink hotcake-like shape in just 30 seconds. This happens because the moonlight passes through the Earth's atmosphere as it reaches the ISS. The Earth's atmosphere acts as a huge lens and thus refracts the moonlight and making the moon appear distorted. These are the coral reefs located northwest of the big island of Hawaii. 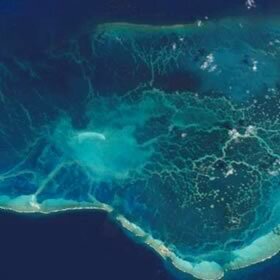 The depth of these coral reefs was captured 3-dimensionally by using the newest technology. This is Chicago at night. 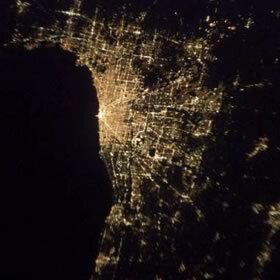 The dark portion on the image's left hand side is Lake Michigan. You can clearly see the main roads radiating from the center of the city. 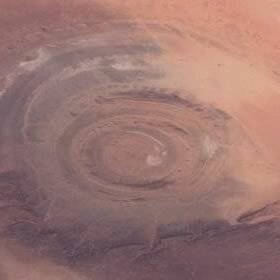 In Chinquetti Plateau, Mauritania, in northwest Africa, there is an odd-shaped area of land known as the "Bull's Eye". The Eye is a 30 km by 30km square with a depth of 90m. The "Eye" is comprised of domal sedimentary rocks that have been eroded by water and wind. 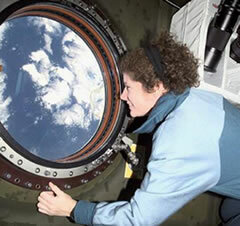 From Earth's lower orbit you can see amazing scenes that were created during Earth's long history. The Eastern region of Santa Cruz, Bolivia was originally a tropical dry forest. Approximately 20 years ago, people started to clear the forest and plant soybeans under a development plan. The forest has been cleared and turned into farmlands in the shape of a wheel that's centered on the communities. A community is located every 5 km, and is connected by highways. The observation of the Earth's surface by the astronauts provides important complementary data with data obtain from satellite observations. The record of human's land-use goes back as far as the 1960s. 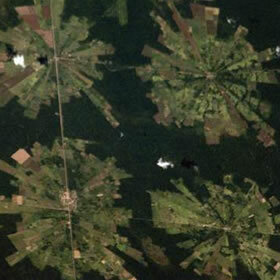 The tropical forests are often covered with clouds, so these images will provide valuable data in analyzing the adverse effects from deforestation.